I have a lot of love for hardware stores, especially the old style one individually run by small business people which an amazing number still are. Popular mechanics has run this piece about the best hardware stores out there. Including an interview of a kid working in a store up the road from me. 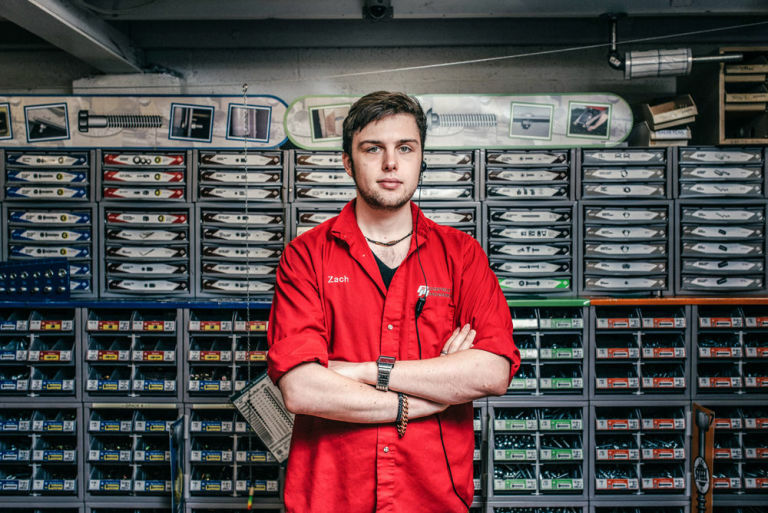 Zach Orbanic is one of the most knowledgeable employees at Ridgefield Hardware in Ridgefield, Connecticut. He is also one of the youngest—by a few decades. Popular Mechanics: So how old are you, anyway? PM: How is it that you know everything? ZO: I’ve been working here since sophomore year of high school. I worked year-round during high school. A lot of it was just being thrown into the situation. The more time I spent in the store, I got to learn. I don’t say I know everything. You throw me in lawn and garden, not my strongest area, but I can work with you and do my best to get you what you need. PM: How is Ridgefield Hardware unique to Ridgefield? ZO: We’re the only real hardware store outside of going to Brookfield or Norwalk. The only thing we don’t have is lumber. But we carry a lot of the hardware you need to work with the lumber. The number of times I’ve helped people build treehouses is innumerable. PM: Can you tell from the way people ask questions what their level of expertise is? PM: Do people bring in pictures on their phone a lot? The kid is a bit wrong in that there are hardware stores in Wilton and another one on Rte 7 in Ridgefield. Still most of the best stores in my area are gone. In between engineering contract jobs in the late 1990’s and early 2000’s I worked part time in hardware store. I’ve mixed my fair share of paint and sold a ton of plumbing. I can assemble chainsaws, wheelbarrows and Weber grills. I’ve hefted the bags of fertilizer and cement. The fact is that hardware requires a wide and diverse knowledge. I think that most people who’ve worked in hardware have had customers like this. Though without so many synonyms. Hardware is a hard business and it can be hard to keep up with changing trends. And the margins are not that great because a hardware store has to have more stuff on the shelf than you can imagine. Hardware stores are problem solving institutions for an unimaginable number of problems. As well as being able to read the constantly changing local needs. If you see the product catalog for a hardware distributer they typically are about 6 inches of open bound pages. The problem is that these problems are all too frequently little or not so little emergencies. Hardware stores, the good ones, are pretty universal. Even outside the US. I went to Tokyu Hands in Tokyo and had no problem finding my way around. I was surprised by the diversity of stock. All the usual stuff, a ton of stuff for crafters and makers, squared aluminum and brass bars, for instance and a good selection of woods. I’m still trying to reason out why they would have a US rural mailbox in the middle of Tokyo. Somebody must have needed one. So they had it. Which is typical of the best hardware stores. A very good hardware store can meet about 90% of the needs that walk through the door. The problem is that as a community evolves those needs may change, but the hardware store might not. It’s hard for a single store to keep up with trends and all too often they are at the mercy of the distributers like Ace or true value for much of their selection and depth of catalog. And the day by day flow of business can overwhelm the owner and things can get into a rut. So they may no notice a slow drop in customers. There’s also the problem of the big box competition and the all too easy pulling in, playing it safe and hoping to ride it out. Which is why so many of the old stores have closed and gone. The institution of the hardware store has changed a lot since they emerged with mass produced hardware in the 19t Century. I suspect that people will always need that screw or piece of plumbing. Hardware stores make living possible because they allow us to get the things done that we don’t want to do everyday. They also supply the people who do those things for us when we don’t want to do those things ourselves. A good hardware store can make life much easier. A great one can help you push your boundaries and develop those skills you want. The problem is finding those great ones. If you do keep going back and give them business. They need it, trust me. Is This What A Hillary Administration Would Be Like?